Это что за чудо юдо? Гм на форуме уже объяснил что этой вещи в игре нет такого уровня и быть не может, все слова в стиле потверждаю, пиздеж казуалов на азартах. в ключах картина стала еще хуже, 1.7% от общего урона, 1 прок в минуту. Lots of comments regarding the 410, legendary/orange colored version which appeared on EU realms tonight. Saw the item linked and clicked on it in-game personally. Fact is, it's possible to fake item links with addons, WoWhead strings, such. You could make a legendary colored tooltip for with +999 strength and spread that as a clickable link in-game - but such an item wouldn't actually exist. Further discussion on the Blizzard forums and on MMOC. Items cannot titanforge high enough to reach 410 currently. 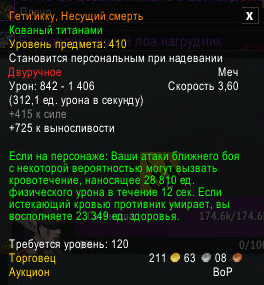 An item can only gain so many extra ilvls and the highest that can drop in the game right now (mythic0) is about 350 or such. Items do not change to legendary color/quality by titanforging highly. This item is BoP - and could not be put onto the AH. Keep your cool everyone and always consider things with a grain of salt. Does anyone know if the bleed proc works on cleave abilities like a DKs Heart Strike? Now the interesting part: It ranked 5th in my damaging abilities, with 11.4% of all damage done. That is MASSIVE. I can't recall any item effect being that strong since Gul'Dan's Draught of Souls. That much damage on a passive effect is unheard of. Hey all, recently picked up the sword on my warrior. I started doing testing with the proc rate to see what it was affected by. If you're wondering it matters if it is in the main hand or offhand and it has any interactions with abilities like 'Furious Slash' which strikes with your offhand .. it does not. You'll do the same amount of procs if this is in your main hand or offhand. So don't be afraid to move it to one or the other depending on what weapons you have. Arms warriors: it doesn't matter..... since you only have one weapon. If you're wondering how I came with the conclusion, I used simcraft with talent points in furious slash. So currently there is evidence to support exactly what I'm describing. do you know if that procs more with paladin's Zeal talent ? Tested with the ilvl345 version. A whole night of raiding in Uldir shows the proc amounts to 3.75% of damage done and it has a 20% uptime. Did this get a nerf? Or does this still do like 10% of your total damage? The baseline proc is equal to 222 DPS and you're trading 200 secondary stats for the proc. This ratio scales all the way to the max ilvl Titanforge. While the secondary stats missing from the sword are on average 150% more DPS than the proc (given BiS secondaries), the proc can be amplified by damage increasing abilities and comes out ahead for just about every class that can equip it. This accounts for 4.5% of my overall damage. Average regular damage was 3618, average crit damage was 6834. Если на персонаже: Ваши атаки ближнего боя с некоторой вероятностью могут вызвать кровотечение, наносящее 13358 ед. физического урона в течение 12 sec. Если истекающий кровью противник умирает, вы восполняете 11688 ед. здоровья.